Cricket fans who had bought tickets online from IPL official partner Tticketgene for Kings XI match at Dharamshala had horrible time in exchanging online purchase copies with actual match tickets. 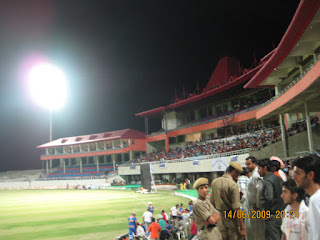 The company was supposed to distribute actual match tickets from 13th April at HPCA cricket stadium Dharamshala which they later postponed to 14th. The guy from company came around 2 PM on 14th and much to the disappointment of the Cricket lovers either some were not given tickets or were given lesser value tickets for Sunday's match. As per reliable resources none from the company appeared on 17th to distribute the tickets. All calls to the customer care and emails went unanswered. People are still hanging around Kachehri Adda, Dharamshala to get the online tickets exchanged for the Kings XI Punjab vs Chennai Super Kings match to be started in next few hours.